In the 18th and 19th centuries, seanchaís were traveling storytellers who were welcomed into Irish villages to entertain and bring local news in return for food and a place to sleep. Now seanchaí Helena Byrne said her role as a storyteller is to keep Irish folklore alive. Many of the stories she tells are about the fairy folk in Ireland. Her grandfather once told the story of a fairy funeral he’d witnessed. Byrne incorporated fairy folklore with stories of the Potato Famine in Ireland in her performance at Ireland’s Great Hunger Museum in Hamden. It houses one of the largest collections of art devoted to the famine in Ireland. The failure of the potato crops in 1846 led to mass starvation, disease, and emigration. Byrne said that the story of the famine and the story of Irish beliefs are not completely separate things. “Because people truly believed the fairies were real, then when the potato crop began to fail, some people were thinking, well, maybe it’s something that we’ve done to upset the fairies. Or maybe it’s something to do with God, with our Christian beliefs as well. So they put holy water over the crop in an effort to save it,” Byrne said. Byrne is sharing stories at Ireland's Great Hunger Museum, 3011 Whitney Avenue in Hamden, at 6:00 pm on Thursday, March 23. 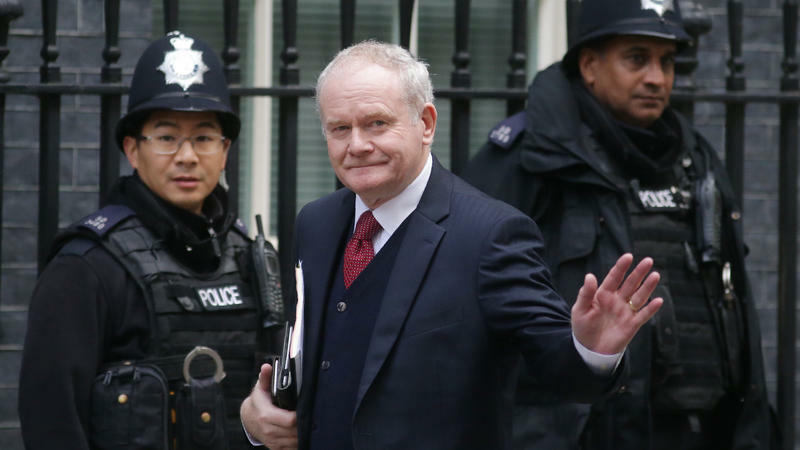 Former Irish Republican Army commander Martin McGuinness, who left violence behind to choose peace — and who eventually met Queen Elizabeth II — has died at age 66. For nearly a decade, McGuinness served as Northern Ireland's deputy first minister. "McGuinness retired from politics in January, suffering from a rare genetic disease. Today, he was lauded for his crucial role in the 1998 Good Friday Agreement which brought peace to Northern Ireland. "Citizen Historian" Project Asks: Did Local U.S. Newspapers Cover The Holocaust? Seventy-two years ago on January 27, the Nazi concentration camp at Auschwitz was liberated by Soviet troops. Now, "citizen historians" in Connecticut are examining how that and other events of the Holocaust were covered in local newspapers. Donald Trump's White House is paranoid, tense and increasingly defined by turf battles​ between top advisors vying to promote their competing agendas. It has gotten so bad that Donald Trump has charged a group of senior aides with monitoring the loyalty of his Cabinet secretaries. The confusion shows and it's rattling America and our closest European and Asian allies.